Geothermal heating and cooling systems are an excellent investment for homeowners. From using natural energy to cutting utility bills, geothermal offers a great range of benefits for Cincinnati households. Learn the basics of geothermal heating and cooling and how your family can benefit from using this type of system. Geothermal heating and cooling systems use geothermal energy found below ground to heat and cool your home. The system uses two components: a ground loop and a heat pump. The ground loop is a network of water-filled pipes which are buried. 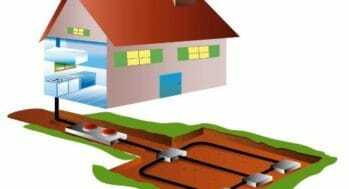 The circulated water carries heat to and from your home; in the winter, heat is absorbed from below ground and carried to your home; in the summer, heat from your home is deposited back into the earth. The heat pump heats your home by extracting the heat absorbed by the ground loop and sends it into your home; it cools your home by removing heat from your home, sending it into the ground loop. Highly Efficient: Geothermal systems are one of the most efficient heating and cooling options for residences. Their heating efficiency is as much as 70 percent greater than other methods, and they offer cooling efficiencies as much as 40 percent better than other air conditioners. Lower Energy Use: These systems use very little electricity to operate. They can deliver as much as five units of heating and cooling energy for every unit of electricity they consume. Lower Energy Bills: Because geothermal systems use so little energy and are highly efficient, you’ll benefit from lower energy bills because your household will be using much less energy for heating and cooling, compared to other types of heating and cooling systems. Free Hot Water: Instead of depositing waste heat back into the ground, it can be used to heat water for your household. A geothermal heating and cooling system can be configured with a desuperheater, which will turn waste heat into hot water during summer months, which is essentially free! Long Service Life: While a traditional furnace or air conditioner can be expected to last around 10 years, a geothermal system lasts much longer. Heat pumps have fewer mechanical parts and the ground loop is protected from weather conditions. Ground loops may come with a warranty of up to 50 years! Ready to see how geothermal can help you save? Contact Nelson Comfort today to learn more about geothermal heating and cooling. Should I Invest in a Geothermal Heating System?